In this article you will learn how to restore your MySQL database from a cPanel database backup within cPanel's Backup plugin. If you've accidentally removed some data from your website's database, or are having some problems with your database, restoring the database to a previously backed up state might be a great option to save you time and hassle. Of course first of all you'd want to make sure that you've already made a database backup to restore from. I recommend making a database backup prior to any big site changes, or just prior to upgrading to the latest version of software that runs your website. WARNING: The method I'm going to review for restoring your database is by using a database backup created directly from within cPanel. By default the MySQL database dump that cPanel creates is going to use DROP TABLE IF EXISTS commands during the restore process. This means that everything currently live in your database on the server will be irreversibly overwritten by the data in the database backup you'll be uploading to the server. So if you're trying to restore your WordPress database because you removed a new post by accident, and you made a database backup just after creating that post, if there have been other new posts or comments since you made that older backup of the database, they will get dropped and no longer be present after restoring. NOTE: If the database that you are trying to import is over 50 MB in size, then you will not be able to import the database through cPanel or phpMyAdmin by default. VPS/Dedicated Server accounts with root access can import a database larger than 50 MB using the command line access. For more details on the actual command, go to mysqlimport - a data import program. For users on shared hosting, you can follow these steps to import a database larger than 50MB. Under Restore a MySQL Database, click on Choose File. Next navigate in the file browser to your database backup you'd like to restore, click on it, then click on Open. You should now see your database backup that you've selected, go ahead and click Upload. Finally you'll see the full backup that got restored, notice how it mentions our userna5_wordpress database already existed, and also it's using the DROP TABLE IF EXISTS command. Congratulations! Hopefully restoring your database to a previous working version that you've backed up, has successfully brought back your missing data or allowed your site to function again properly. You should also learn about how to backup website files in cPanel, and restore website files in cPanel to complete your knowledge on how cPanel handles restoring the different parts of your account. The only way to 'restore' files would be to upload them from your local machine. This is best done via FTP. Hello. My hosting site is Justhost. I need to reinstall my site. I have a backup that I downloaded using Akeeba backup in the Joomla backend. But I am unable to get back in there. How do I restore the backup via Justhost cpanel? Thank you for contacting us. Here is a link to our walk-through guide on Using Akeeba Kickstart to Restore a Backup. You should not need access to the backend to complete this guide. Hello,I have uploaded the database successfully on cpanel but still if we insert the data online its not getting inserted in the database.And I have checked the code its working on localhost with database insertion and all.So please can anyone suggest solution for it ....? Thank you for contacting us. I recommend contacting Live Support, so they can test and replicate this issue within your specific account. Thank you for contacting us today. To restore a database over 50MB, I recommend uploading using FTP first. Then submit a ticket requesting assistance importing. Live support will import the database, and email you back upon completion. Hello Moni, and thanks for the question. It depends how you've backed up your website, as to how you might edit things before restoring them at a new web host. Did you backup your website files in cPanel using the Download a Home Directory Backup feature? If so, you would have ended up with a backup-example.com-7-24-2014.tar.gz archived file. 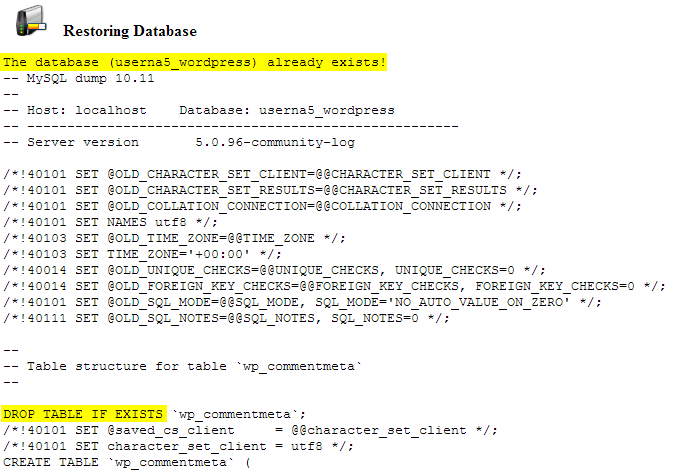 Or if you backed up your MySQL database in cPanel, you'd end up with a userna5_wordpress.sql.gz archive instead. 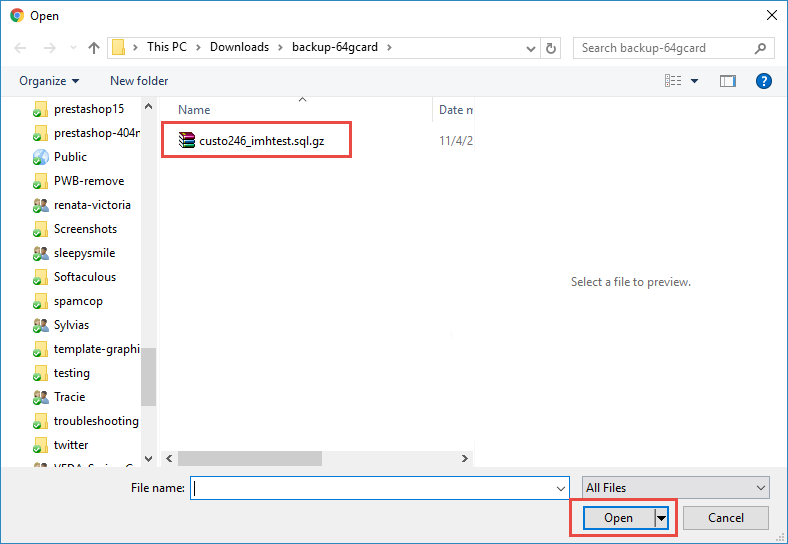 You could use a program like 7-Zip in order to extract these archives and edit the files or database directly before restoring it to a new hosting account. However depending on what type of software you used on your website, you may or may not be able to do this locally on your own computer, and you might have to make your edits live at the current host, backup your files with the changes made, and then restore that to your new web host. If you had any further questions at all, please let us know specifically what exactly you're trying to do, and we can try to come up with a better solution for you. Hello Moni, no problem at all. If your website was simply made up out of HTML pages, such as index.html, then you could just open them locally and start changing things like the title of the page, the styling, and so on. After you saved them, you'd just place them back into a backup-example.com-7-24-2014.tar.gz archive so your new web-host can use the cPanel restore process. However if you used a CMS (Content Management System) like WordPress, or Joomla, then you'd probably only see the application's files like index.php. Being a .php script, these files typically interact live on the server with your database to build up the content of your site. So more than likely if you ran across a bunch of these, you'd probably want to just restore everything to your new host, and then start making your modifications live instead of trying to handle them locally before having the backup restored. Hope that makes sense, and if you had any further questions at all please let us know! Once your site is complete and modified onto the new server, you could covert most .php scripts to .html but they would lose any dynamic functionality they had from being server-side scripts, as you would be making them just static files. There is a bit more info about this subject in my dynamic vs static website article. If for instance you had a file called flowers.php and it was just a page with a bunch of pictures of flowers on it. You could open up that page on your website http://example.com/flowers.php and then hit Ctrl-U in your web-browser to view the page source of that page. Then you would hit Ctrl-A to select all of the text, and then you can just copy and paste it into a brand new file called flowers.html. PHP is a server-side language that basically generates HTML documents dynamically as they are being requested, so you can always look at the resulting HTML code your web-browser gets and see what the PHP script spit out. If you're using a PHP CMS (Content Management System) such as WordPress, it actually routes all of your traffic through the index.php script, so in these types of cases you wouldn't want to copy down the raw HTML from your web-browser. Instead you'd want to login to the WordPress dashboard, and then you would use the web interface to actually go in and manipulate your pages and posts in the database so that it changes what WordPress's index.php file shows on your website. Hi, I have called my hosting site (Hostgator) twice to help me with the "file already exists" issue on cpanel; they say they have deleted all info so I can move forward in creating my blog but after waiting 3 hours it is still the same issue. Do you think I should cancel my account and start all over? Thank you Kindly. Hello gaby, and thanks for your comment. Did you already previously backup your MySQL database in cPanel? If so, by default it should have created a backup file that contains DROP TABLE IF EXISTS lines before each of your CREATE TABLE statements in that backup file. You can see in the last screenshot on this guide for restoring your MySQL database in cPanel that you will get a message saying the database already exists. But it still goes ahead and drops any tables that exist in that MySQL database and then should proceed to create them all back with the data in your MySQL backup file. I'd ask them to restore the database for you if you're still having issues. If you wanted to cancel your account and start over with InMotion Hosting we can assist you with restoring a database backup if you were running into problems doing it yourself. hello, I have download a database for backup and did a test restore thru cpanel. It always keeps coming up error or timeout. I did a few downloads to make sure the file was not corrupt. How large is the database? Could you provide the specific error that you get?